Some fifty delegates representing economic think tanks, research organisations and advocacy groups from the Asia-Pacific, Africa, Europe and North America assembled in Jaipur, India from September 25 to 28, 2003, for the 5th Workshop of the “Economic Freedom Network Asia”. During the three-day conference, the participants discussed the methodology, the application and also the political relevance of the Economic Freedom Index in the Asian context. 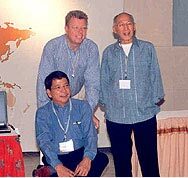 The Philippines were represented by two senior members of the “Foundation for Economic Freedom”, Prof. Dr. Alex Magno and Ernest Leung, President of the Philippine Stock Exchange. The Economic Freedom Index is an annual compilation of data representing factors which make a country economically free. It ranks 123 countries representing 91 percent of the world population. The data in the index clearly supports the assertion that there exists a correlation between the degree of economic freedom and development. “The more economic freedom a country has, the more economic growth is recorded”, said Dr. Michael Walker of the Vancouver-based Fraser Institute, who developed the Index together with other liberal economists. At the Jaipur-workshop, papers dealing with the state of economic freedom in the following countries were presented: Malaysia, India, Thailand, China, Indonesia, the Philippines, Germany, Australia, New Zealand, Pakistan, South Korea, Bangladesh and Sri Lanka. Furthermore, economists from India and China presented adapted versions of Economic Freedom Indices for their respective countries. The Friedich-Naumann-Foundation is one of the 58 members of the international Economic Freedom Network. By supporting the Asian network, the Foundation aims at promoting the basic liberal argument that economic liberalization is the key to growth and economic development. The full text of Prof. Magno’s paper entitled “The Foundation for Economic Freedom: Role and Tasks in a Milieu of Protectionism” is available in our Liberal Library.